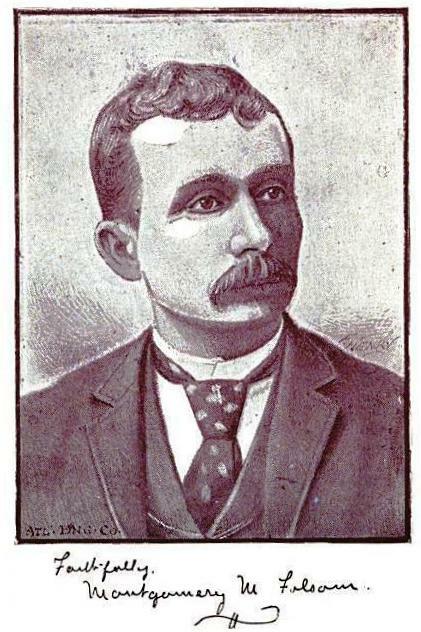 Montgomery M. Folsom, from his 1889 book, Scraps of Song and Southern Scenes. Found this 1889 account of the history of Troupville, GA by erstwhile Wiregrass historian, poet, and humorous writer Montgomery M. Folsom. Folsom starts his tale at the headwaters of the Okolocoochee and Withlacoochee rivers. He traces them down to their connection with the Withlacoochee, at which point Troupville was founded. As the government seat, Troupville was the center of legal and civic activity for Lowndes County (see An Antebellum Trial at Troupville). Troupville was also an important center of commerce and social life for the pioneer settlers of Lowndes County, like Levi J. Knight, who established the first community near the site of present day Ray City, GA. The Knights settled on another branch of the Withlacoochee; Beaverdam creek, at Ray City, flows into Cat Creek on down to the Withlacoochee. Atlanta Constitution, January 29, 1889, Pg 12. VALDOSTA, Ga., January 19. -[Special. ]- Away up near the northern limit of the great wiregrass section there is a big cypress swamp. They call them bays there. From this bay emerges a little stream of claret colored water. This is near Peckville, and close to the corner of Worth, Irwin, and Dooly counties. This is the head of the Ockolocoochee, Little river. Farther eastward, some ten or fifteen miles, there is another bay from which emerges a restless current that goes rushing away toward the south, fretting among the pine boles, resting among the silent solitudes of the mysterious swamps, the Alapaha. About midway between these streams, some twenty miles below their heads, the Withlacoochee steals stealthily out of the depths of a brambly brake and glides noiselessly away, like some black serpent of the swamps winding in and out among the barrens. The Ockolocoochee curves and twines among the pine-clad ridges, receiving the tribute of some lesser stream at every turn. Ty Ty, Warrior, Big Indian on the West, No-Man’s-Friend, Frank’s creek from the east, till it reaches Troupville. It is, properly, the river, despite the fact that its name is lost after its confluence with the Withlacoochee. It is like the wedding of a great big strapping wiregrass girl with a short, stout, presumptive little man. The Ockolochoochee is the stream for fishing. Along the snowy margin of its glistening sand-bars the red-belly, the perfection of perch; and in its placid eddies, beneath the shadow of the tupeloes, the red-horse sucker, chief of all the carp tribe; abound in strength and numbers sufficient to gratify the most inveterate of anglers. New river gives the Withlacoochee a good start, and it swerves away to receive the tribute of half a dozen streams on its tortuous course. From its fountain head it is dark and forbidding, and the secrets of its black waters are preserved most faithfully. Away back in the olden days when Lowndes county was as big as Poland, an act was passed by the Georgia legislature, appointing a commission to select an appropriate place for a county site. Franklinville had been its capital, but was not near enough to the center. As the legend goes, Big Billy Knight and Big Billy Folsom were appointed. These two worthies, one from the pimple hills of the Ockolocoochee, and the other from the saw palmetto flats of the Withlacoochee; decided that the most appropriate point was right in the fork of the two rivers. They had an idea that the river would be navigable that high up, even above the point where the Alapaha disappears and runs underground a mile before uniting with the Withlacoochee. So it came about that where the wine-red waters or the Ockolocoochee and the black current of the Withlacoochee meet at the end of a long sandbar and go tumbling and writhing, eddying and curving down the long reach of moss-grown trees, like two huge serpents struggling for the mastery, the plat of a town was drawn, and it was called after Georgia’s great chevelier governor, “Troupville,” with a strong accent on the “ville.” They had not learned to say “Troupvul” then, and it was such a high sounding title that they lingered lovingly on the pronunciation. The town grew apace. It enjoyed what the modern’s call a boom. Land lots sold rapidly, and settlers came rushing in, mainly the Smiths. Lowndes county has ever been prolific in the smith line. Owen Smith, Old Billy Smith, Young Billy Smith, all sorts of Smiths, even down to our Hamp, who so ably represents that historic name in the present pushing metropolis Valdosta. One of the Smith’s built a tavern, and another Smith set up in business, and young Dr. Briggs, who came from the north, broken in business, but full of energy and ability, and laid the foundation of that prosperity that has long distinguished the Briggs and the Converse families. Troupville only suffered one inconvenience. To get to town three-fourths of the population had either to cross the river of the east or the river of the west and half the time, during the winter and spring, these rivers were raging with freshets, the bridges were afloat and were frequently swept away. One thing more hindered her prosperity. At the only season when the main river was navigable, the Old Nick, himself, couldn’t navigate it. So it transpired that the only freighted barge that ever tempted its tempestuous tide was a flat boat that went down the river to the Suwanee, thence down that river to Cedar Keys. The boatmen sold the vessel and cargo and walked home. Life was too short to navigate that crooked stream, with its sunken logs and treacherous sands, and the hope of water transportation was abandoned. Among those who settled in Troupville and left behind many momentous memories, was Morgan Goodgame Swain, a burly blacksmith from Emanuel, who was ever ready for a fight, frolic or a footrace. He stood six feet three and weighed over two hundred without pound of surplus flesh. As handsome as a Greek god he was gifted with herculean strength and a heart that was generous and true. He erected his forge on the bank of the Ockolockochee, and his wife took possession of the tavern. Becky, she was lord above, and Morz was lord below. The town of Valdosta was laid off when the old Atlantic and Gulf Railroad was built, about the opening of the war. Brooks and Echols had been cut off from Lowndes, and the county site was moved four miles southeast of Troupville to Valdosta. A great many of the buildings were moved bodily. And now there is not one brick upon another to tell the story of Troupville. A pile of white rocks marks the spot of Swain’s old forge, and some weather beaten mulberry trees still bud and blossom around the old square where stood the tavern. Aside from these there is nothing left to keep alive the cherished hopes that once animated the soul of Troupville. The Withlacoochee still glides along to meet the Ockolocoochee, and the land that lies between them, once town property, is now a barren waste, overgrown with somber pines, solitary tufts of bear grass whose white crests wave to and fro in ghostly suggestiveness in the twilight of summer evenings when the whip-poor-wills chant their weird melodies among the lonely thickets. Around the once populous portion of the town lies a waste of sedgy fields that are barren and unproductive. The half-wild goats browse among the fennels and briars. “Ichabod” is written in lichen crusted letters, and desolation reigns supreme. Love to read about Troupville, GA. I grew up by the Little River. The old Troupville cemetary is just across the street from my childhood home. I would love to see some of the maps or town plats. Beth, I too am also interested in the site of old Troupeville. If you ever come across any maps or town plats, I wish you would let me know where I might find them, I plan to visit the Lowndes Historical Society soon and see if they have any old photos, maps, or plats,I’ll let you know what I find. Thank you for such a fascinating post. As a native son of Troupville I simply loved reading this, especially interesting to me was the mention of fishing for red bellys on the Ockolocoochee (Little River). I was born and raised a River rat on that river. I’ve managed to see a lot of beautiful places in this world and been to many fine restaurants in my life – but I’d take a day of fishing on the Ockolocoochee followed by a fish fry of river red breasts over them all – enjoyed this immensely.